Nice, I never got around to playing Bloodborne or Ratchet. Now is the time, my friend! Bloodborne is a masterpiece! It is my favorite PS4 title so far, (would probably be supplanted by Last of US Part II when it comes out) and, one of my top five favorite game of all time! Rachet and Clank is no pushover either. Try both. This is easily the best PS4 PS Plus Month ever. You wont regret it! Sadly though, I already platinumed both but the fact that people will try out Bloodborne is reward in itself. I’m planning to buy its DLC soon. I bought Bloodborne over a year ago but hadn’t gotten around to playing it yet. I guess this will teach me not to buy games until I actually intend to play them! I played Ratchet and Clark and was just about to pick up Bloodbourne. Glad I waited. Also if you can get Mighty No. 9 for free then it’s worth playing right? So does this mean we will get more ps4 games once ps3 and vita games stop or just 2 a month because that sounds bad. I like the cross buy games eith vita and i was considering getting a vita because I now have a large collection of games for it. Same here! It really didnt grab my attention but the overall response was really good from friends think i might give it a shot! 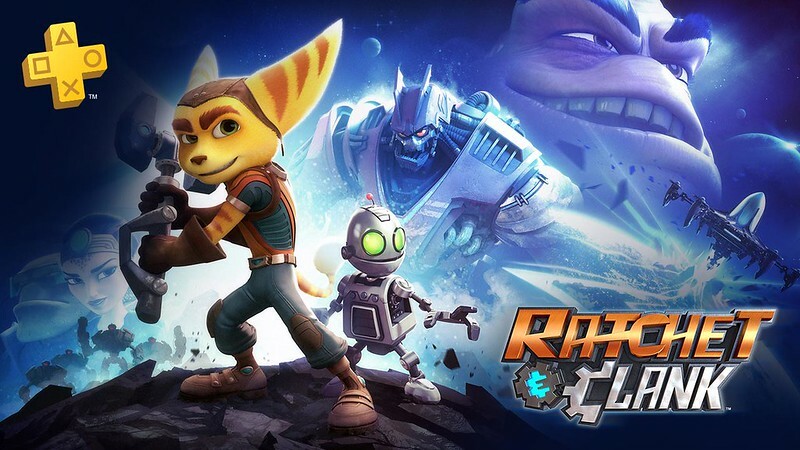 As for Ratchet i cant wait for that really fun and well thought out game. So us Socomer’s won’t see a Socom release then? Very unfortunate. ps3 came out in 2006. Its time to move on guys. PS5 will be on its way soon and people are complaining about a system thats over a decade old. Hell Sony even gives its timeline in advance for when things will be released and old products retired. They’ve said before they run a 10 year product cycle in most cases. PS4 came out in 2013, so half way thought its lifespan (5 years) they release ps5. Then around 2023 they will stop promoting and supporting ps4. PS6 will be released around 2023 or 2024. im sure their is people complaining about how they don’t make ps2 games anymore… people will always complain about something. I understand that Playstation wants to concentrate more on PS4, but why stop putting out games for PS3 & PS Vita. There’s still a lot of gamers that love playing those game systems, and that’s one of the biggest reasons why I stick to PlayStation instead of Xbox. I get more for my money. Recently in the past I was getting discouraged because just about all the games PlayStation was putting out to the PS Plus customers every month for free were the worst games I’ve ever seen. But recently they’ve been improving. I really hope PlayStation would reconsider stopping PS3 & PS Vita from getting anymore monthly free games because then I’m going to feel like now it really doesn’t matter if I stay with PlayStation or go with Xbox. It’s the same price $60.00 annually. But I don’t want to spoil it who puts out better free games monthly to their paying customers. amazing line up this month. 2 great games. I own them both already so I have played them. Far as the Socom post. Sony clearly said they have zero intentions of making a new socom game any time soon. They even announced this. Keeping your hopes up will only keep you disappointed. Socom is dead pure and simple. I own literally all but two of these games already (Ratchet & Clank and Bombing Busters), but this is the best month I’ve seen in a while. And Bloodborne is my absolute favorite game of all time, so I’m excited to co-op with new hunters! Question regarding the service change: After PS3 and Vita are cut off from IGC, will cross buy still apply? For example, if a game such as Axiom Verge, which includes cross-buy, became part of IGC, would you get both versions, or only the PS4 version? Actually duke the PS Plus catalogue has been pretty decent. Worst games you’ve ever seen? Man you don’t play many games do you? If you think these games are garbage if you think the games we’ve been getting are garbage, fine go to Xbox. Go spend $400 and then realize that you’re getting marginally better games (not accounting for specific tastes the metacritic scores tend to be pretty close every time I check) and miss out on the TONS of exclusive games that Sony pours their heart and soul into, while Microsoft cancels the next Scalebound or hypes up a broken beta of a game like Pub G when there’s a better version that runs better on the same engine made by the company that owns the engine. I’d buy a second Switch before I bought an Xbox one for $100. Some of you Bloodborne players might recognize me, but Bloodborne is definitely fun and worth trying. It isn’t for everyone, but we’ll see. Honestly, I find it sad that we are losing the Vita. The Vita is great, just the support for it is terrible. The PS3 is a loss, but hopefully it means more support for those games on the PS4? Probably the greatest month of PS+ ever. Great line-up this week, probably the best one so far! I can’t believe the spanish Playstation employee was right! I mean, it’s a full year away before that happens. We’ll probably already be pre-ordering PS5’s by then. On first reading I didn’t even realize that it’s an entire year before the PS3/PSVita games are being dropped….unless that was a typo?? I rarely ever boot up my PS3 to game anyway, mostly just to watch Netflix. It was going to happen eventually – so having 1 full years’ notice is appreciated. But given that the price won’t drop (nor do I expect it to); what will we get instead of the PS3 and PSVita titles that we’ve been receiving for the past few years? Will we receive a third PS4 title per month? Something else? Like PSNow access? @ CrossStitch – Y’all need to STFU about PS5. As big of a Vita fan as I am, I can understand this change. It’s has to happen at some point, and happy we’ve been given a years notice. Same here (Vita fan thru and thru). It was bound to happen eventually, but I’d ask Sony not to turn off the Store since I’ve spent a metric ton of money in Vita, PSP and PS3 purchases all these years. @steeler192 they won’t stop the Vita store anytime soon. The PSP store closed in 2016. @mh637099: The PS3 came out two years after the PSP, so the PS3 store could be closed at the end of this year, following that logic. I fear for it as well. @mh637099: Wait… I looked and the only thing that closed was the store app in the PSP device. Purchase of PSP games on the web storefront is still supported, as well as in-app purchases. I have a feeling there will still be some ps4/ vita cross games they just won’t ensure there will be 2 every month. Whoa whoa whoa, you are halting games for the PS3 and Vita, Hell I still use all 3 consoles weekly. Not just my PS4. My Boys play my PS3, I play the vita out and about and we share the PS4. So now you are just giving people like me the shaft. Relax. Take a deep breath. PS3/Vita games are ending NEXT year, so 2019. What’s will be left on those platforms that already hasn’t been included? It’ll have been 5 1/2 years since the PS4 launched when this change happens. How long do you expect PS3 support to last? Any game you’d still want for PS3 that you don’t have has to be super cheap by now. They also increased the price of PS Plus in the EU not long back, making it cost more then the US for the same features. Now everyone is getting less, so why increase the price to end features so quickly after doing so? So are you saying that no longer getting 2 free games a month next year on a PS3 and Vita will make you stop using them? I am saying that why make me pay more when you are taking things away. That makes no damn sense. Its a smart move, you are in the minority unfortunately and doing this might mean even more PS4 games coming to the free library. I to have a ps3 and a vita but with so many games being ported now it makes sense. Both systems have been discontinued and no company makes games for them anymore. I stopped buying PS3 and Vita games ages ago and Im sure the majority gamers worldwide are the same. Basically. I feel your pain though. They are probably trying to get you guys to let go lol. If you jump on the PS4, you really have nothing to lose, but if you are sticking with the PS3/Vita, then you have to decide if it’s worth it. I honestly don’t think it is. You can probably grab most of the titles you collected from PS+ for under $20 each with sales and such. Not worth it to me to hold onto it after next year. They are obsolete platforms and they give you a full years heads up. I would assume a third PS4 would be added then but they don’t have final details on how they will do that other than them being able to focus on the current gen then. Good news for your kids at least since maybe now you’ll have to stop being such a cheapskate and buy them some decent games instead of having nothing but the free dumps of mostly garbage with an occasionally great game thats so old you can already find in a bargain bin. Of course games are still made for the Vita. There may not be as many as there once were, but companies are still making games for it. It’s not a dead console yet. Yeah, Vita Games are still being released in Asia (several with either English language or Subs) at what seems like at a rate of 1 or 2 a week. And console mpanies like NIS America and XSEED continue to localize games as well. The Vita is alive and well for those still seeking to find games for it. I’m disappointed about the Vita as well – still very active playing Vita and still lots of games to choose from. Whoever said no company makes Vita games anymore is wrong – go look at the Vita section on the oz game shop for example and you’ll see plenty of new titles, particularly in the visual novel genre which Vita is ideal for. Titles like Root Letter and Psycho-Pass that I could have played on PS4 too I actually enjoyed better on Vita. One of the best PS plus free games for Vita ever was Code Realise. Nice to have a year to get used to not having my free Vita games each month and I’ll still be happy as long as the Vita store is still up and running. I just hope that with this removal of PS3/Vita games, we’ll have more ~free~ games available each month. And yet, still, no retrocompatibility. Way to go, Sony. Ps2 games, Require a physical actual chip in the system, Making physical emulation near impossible due to having extensive power required to emulate the chip & The system which floors even low high end PCs. Xbox can emulate, cause they played it safe in there three system and used PC architecture instead of trying to innovate with new technology. Kinda have to disagree there. PS2 games work fine on a PS4 with a bit of tweaking, having played several PS2 Classics, they work just fine, even uprezzed. PS3 games also work fine on a ps4, as has recently been noticed while running Linux, on, um, a “Development” ps4, and running the RPCS3 ps3 emulator on it. Sony have a history of creating cool hardware and then abandoning it. PSP Go, PS1 games on Vita, Vita itself, ps3’s PS Move and so on. The reason ps3 games arent running on a, um, Not-“Development” PS4, is because sony didnt want them to. @Zetra3 The Xbox 360 used a PowerPC RISC CPU, a completely different architecture from the AMD APU on the Xbox One, and they still managed to emulate it. The Xbox design team had backwards compatibility in mind since the design phase, and had Microsoft’s money as well as their emulation and virtualization expertise and resources at their disposal. They created the Xbox One APU with specific hardware designed to emulate the Xenon CPU. They knew there was value in it and cared to do it, and users have responded accordingly. Sony didn’t do it for reasons known only to them, but Microsoft showed that when there’s a will, there’s a way, and that people do care for backwards compatibility. Honestly, if Sony really wanted to add backward compatibility they would find a way. But they never will, because if they do it will only hurt their bottom line. Backward compatibility would kill PSNow, and we all know that Sony puts their greed above all else. They have a steady flow of income from PSNow, so why would they all of a sudden want to stop that? The only way anything is going to change is if people stop subscribing to PSNow, but we also know that people are too self-absorbed to do anything like that. @pavachan33 All those 2 PS2 games have been rewritten to the PS4. Not just tweaked. all rewritten. You cant just put a PS2 disk i your PS4 and expect it to play cause it wont with out the PS2 hardware installed in the system. Backwards compatibility is only a priority if you’re not releasing lots of awesome new games. I was XBox and shifted to playstation with the PS4 and I’ve not really kept up with what XBox is doing but my impression is that XBox needs that extensive back library of games because they don’t seem to have a lot of new stuff. Playstation has so much great new stuff I wouldn’t have time to go back and play old games – I don’t have enough gaming time to play all the new games I’d like to! Take note: I can play PS2 games on a $35 Raspberry Pi 3 B+. Even though that’s maxed at 24 fps, for now (until an emulator is made more efficient, to take less processing power). 24 fps was the the standard movie frame rate, for 100 years, and the academic scientific literature shows that average gamers playing at 29.97 (“30”) fps don’t do any worse than they do, when playing at 60fps, when they’re of the frame rate at which they’re playing. Only pro players show such a parametric, statistically significant difference, and given that you’re taking the time to write that rather meaningless and incorrect post on a PlayStation blog article, I can pretty safely assume that you’re no professional gamer. So, it’s unlikely that playing 29.97 fps games at 24 fps would make any difference to your gaming performance, and the 24 fps rate at which movies were filmed, for so long, give the cutscenes in PS2 games a slightly more “cinematic” quality, but that’s a personal preference, not a general one. However, to the point, it would be pretty sad if you were right that a $250 PS4 can’t emulate a PS2 flawlessly, while a $35 single board computer can do it pretty well. So the writing has been on the wall for this change for some time, no surprise there, but it does bring up an important question. Since you will no longer be including PS3/Vita games, that does bring the “value” of the monthly free games down. Does that mean that instead of including PS4 games that retail for ~$20 nowadays (like Bloodborne and Ratchet & Clank above), will you be stepping up to newer games with a current value closer to $30 or even $40 starting next year??? Does it really though? I mean, even when you remove the PS3 & Vita games that don’t offer cross-buy, you’re left with a collection of games that equates to the value of the annual membership…and that’s just one month. Bloodborne $20, Ratchet & Clank $20, Claire: Extended Cut $15, Bombing Busters $7. Actual value, and the individual perception of value seem a bit skewed by your logic. I don’t think that simply making more expensive games FREE is going to change things, nor do more expensive games generally mean better experiences. Several of my Top 10 are indy, or smaller studio releases on the budget. Not everyone is just willing to bend over so easily. Do you have cognitive problems or you’re just brainwashed by corporatism? We are paying customers and yes, we have all the right to complain about a service that we pay for. if you are paying customer then speak with your wallets. you aren’t happy with the game selection then cancel your PS Plus subscription. Sony even provides the link IN THIS POST! I don’t suffer from cognitive problems dvictor but just as you have the right to complain about the service, I have the right to judge you as being entitled. Tell your parents to cancel the subscription if the free game selection for a month bothers you that much. You could bet that I would cancel my membership with how much I dislike the free games. However due to the bs of having to own the membership to play online I am forced to cough up $60 a year to play. Will it be the complete edition of Bloodborne? They are dropping PS3 games NEXT year not this year. Best month for Plus since it’s inception. Losing both the Vita and PS3 games hurts badly. Hopefully, VR and Indie games will take their place. @investor9872 yeah, but we still have a year for that. When you say games we have downloaded or will download before March 8th, does that mean specifically downloaded games? Or does it mean games in our library period? Because I need to know whether or not I should start downloading everything I haven’t played yet in order to preserve access to it. Most likely games added to your account. I hope you give better sales then for those consoles. These are one of the reasons I still was happy for my PLUS subscription. PS4 games are great and all, but I’ve always loved new games for my vita. Those the few psp games you threw out to it were weird. I’m excited for Bloodborne and never played any Ratchet and Clank, so those are great this month. Still will dearly miss ps3 and vita games. I just played XBLAZE from Jan’s Ps plus and it was really fun. Fully agree with you, PS+ is what kept my PS3 and Vita alive. PS3 has been supported for very long time. It has to happen one day. So to have access to my games on PS3 & Vita after 2019 I need to keep paying for PS+ (as they don’t work without subscription) but I will not get anything for my ongoing membership (no PS4), or will the restriction to play the older games in my library be removed ? @ trigg-10 – Hoping I hear the answer to this too. If they are ending support for these systems they should make it so any games from the PS+ Free game promo doesn’t require an active PS+ subscription anymore. I don’t have a PS3 as I miss that whole generation but have wondered what would happen to the PS4 when they end support for it too. Would hope those would just be “give mes” after support is dropped as a final “Thank You”. this is far from the greatest PS plus month. last month was better. I have played everything on this list besides the two vita games on this list.. I rented mighty number 9, legend of kay and bloodbourne and did not like them. I already owl Ratchet and Clank. even if the ps3 and vita were not good i still enjoyed getting them. I wish they were still keep giving them out or at the very least give more ps4 games out instead of trying to only give us the two ps4 games. Knack and Rime weren’t that good, just Grand Kingdom was. I don’t recognize that month as better. Welp, too late now! Thank you for the awesome games! The loss of PS3 and Vita content will officially kill the Vita for me pretty instantly, and the PS3 eventually once I clear some of the backlog. I really enjoyed the PS+ Vita content and it’s what has kept it running all this time. Very sad to see it go. They better really increase the PS4 games to make up for the loss of two consoles at the same time! That’s weird, considering that the vast majority of free Vita games they’ve given out have been garbage. Maybe you should try some of the good games on there instead. Seriously????? No more free PS3 games? I love this month’s free games though. I hope u can rethink the decision that after next year March that we still have to be a member for Plus to keep playing PS3 & Vita Games. Some of us have been here since the beginning of plus so it’ll be a nice incentive or a thanks for supporting your service if we can keep these games because let’s face it. We’re not going to be gaming forever so it’ll be nice if we have something to past on to our Kids & Grandkids. They’re not going to give you hundreds of games for free. “You get to rent games” You never owned the license, It won’t make sense. They would have to contact all those developed and publishers to make new deals to do this. Dude, People don’t develop for PS4 & Vita anymore. There running out of games to give. Welcome to consoles, These things die & stop being supported. you have a year. be thankful you get 12 more months. Vita gets new games every month. It didn’t this week,but it got 3 games last week. I was hoping for something to make “legacy Plus games” permanent. They could, at least, allow us to buy the games that we got through Plus, on the website. Extra discounts would be appreciated. How hard could it be to allow you to purchase something that you already own, with a pop-up saying that you already own it through Playstation Plus, are you sure that you would still like to purchase it? Developers still makes games for the Vita. There may not be as many as there once were, but the Vita isn’t quite a dead system yet. @mmitch079 So will I have to play all my free PS3 and PS Vita games before March 2019? Or, Will I need to pay US$60 to play the old free games??? It makes no sense at all. Well, frack, I should have waited a couple more weeks on Bloodborne, then. :/ Never played R&C, though, so that’s gonna be pretty neat I guess. Not really impressed with the other titles, sadly. Love how we are getting bloodborne been wanting to try this out for awhile now. Its nice to see the PS3 and vita games getting dropped to get better PS4 titles but why a whole year until this is implemented??? My PS3 is covered in dust for sometime now basically since 2013 when the PS4 came out. If I subscribed last month, and found out it was being discontinued in April, I’d be pissed and demand my money back. It’s important that people get what was advertised. At this point going forward, they know that their 1 year subscription will only get them Free PS3/PSV Plus titles up until the beginning of March. So if someone subscribers for a new year in June, they’re not surprised when starting April they don’t get PS3/PSV titles as apart of their PS Plus 1 year Subscription. I mean, the Vita was already short-changed by getting cross-buy minor titles anyhow, but they were mostly enjoyable. Now celebrate the last year with some major Vita-only titles? NISA isn’t a small indie company nor is Tecmo Koei, Idea Factory, or Atlus, so your statement is invalid. To bad i ready own Bloodborn & Ratchet & Clank i can afford my games and not beg for them to be free. Bloodborne is probably the best game I’ve ever played. It was coming. Hope this means something new will get adnounced soon. I want to update my PS4 but the pro isn’t enough of a leap to make the plunge yet. But glad we get a year of free stuff still that 24 vita and 24 PS3 games till it ends. Ironically the vita games are the only ones I don’t own on the list and almost bought a good few times. So I’m happy. Bloodborne is a must own game. Ratchets fun though, but needed coop. Thanks for all the great years of PS3 and Vita games! Even with all the crap we gave you sony over the years, they will be darley missed. With discontinuing Vita and PS3 games next year hopefully they’ll drop price of PS Now to compensate. I think that would be a good gesture to your customers. Looking for the next fallout4 DLC sale. Would rather see PS3 support cut off, you were running out of stuff to give. Vita, still has some amazing games left. Hopefully a good sendoff in these 12 months. (Probably get a Cross Buy game every now and then after 2019 March). Many got the Vita because of the amount of free games that added up. Made it much more enticing to pic it up. I guess we are getting 6 PS4 games on March or April 2019? That’s a good question, are they going to up the amount of PS4 games to give? While I don’t see them doing six, maybe four, but it dang sure better not stay at two. I too am sad that they’re doing away with the Vita games, I play mine all the time time. Like you I hope they give us some of the best Vita games for the rest of the time Vita is on here. I was expecting to lose PS3 support but Vita still gets new games every month. Not only that but thanks to Cross-Buy the PS4 was getting several games some months. We are going to get less games, at the same (recently increased) Plus price. So this is it. Only two PS4 games/month, nothing more. Every month I find it more difficult than it needs to be to parse these posts to get the full list of games. In the future would it be possible to make the “This month’s PlayStation Plus lineup also includes:” list a “This month’s full PlayStation Plus lineup includes:” list that includes the top two games, so everything is in one list and we don’t have to hunt through the first paragraphs for the big names? At the VERY least, could we at least get the names of the games bolded in the text? I want “the best of the best” PS3 and PSV titles each month till March 2019 then. Don’t give us weak games each month and then fizzle it out. Such a shame… losing PS3 games and Vita games. Well more Vita than PS3. It made me use the handheld a lot more than before. Guess it will return to collecting dust after 2019. Other than that Great Month for offerings. Plese let us know how the #ps2ps4 games are going.. There has been no word and i cant find much information! There are so many ps2 games that need this! I’ve been waiting to see how great PS Plus could be when its solely focused on PS4 gaming. Looking forward to next year and hope we get more launch week discounts with digital releases. As the 1st Tuesday of March 2019 is the 5th, shouldn’t the effective date of the change be March 5th instead of March 8th? will there only be 2 ps4 games each month after March 2019? Yep, it’s been confirmed, just the 2 PS4 games, the PS3/PSV games are being replaced with literally nothing. It’s confirmed that there will only be 2 PS4 titles offered going forward from March 8th, 2019. Whether that may include PSVR or some sort of PS1/PS2/PSP emulator on PS4 or anything like that to fill in the gap is unknown. If they do stay with 2 PS4 titles, and that’s it…I’d expect the quality of PS4 titles to go waaaaay up. To be fair, they didn’t confirm nothing would replace them. All they said is that there will only be 2 PS4 titles. That could mean something else is coming and/or other benefits. I could see them throwing PSNOW or another service in, or allowing for classic titles (such as the PS2 on PS4) to not be included in the “PS4” free games. I’m not saying that is what’s going to happen, but they’re certainly capable. Awesome month you guys! 2 1st party exclusives. And even great games on ps3 and Vita! Anyways I know you’re gonna get people who are gonna hate no matter what. Thank you for your hard work and I can’t wait to see the future. Hopefully Vita 2! Yeah, we are asking to spend money. So consider it. I understand Sony moving away from PS3 and PSV to focus on PS4 for IGC. It makes good business sense. But I am kind of sad. Currently, I do not take advantage of PS+ games. It is because I want to “own” my games. With PS+ games, you need to keep PS+ to use them. So, I just buy my games when there are digital sales. Yes, I know technically I don’t own any digital game. This is why I also don’t use GwG for XB1 because you have to keep Gold to have the game but I do for X360 because you “own” them meaning you do not need to keep Gold to play them. But I did use IGC in the past…I got Tomb Raider, Sleeping Dogs, Batman Arkham Asylum, Batman Arkham City, DuckTales Remastered, and Castle of Illusion. I beat all of those games. I love them soooo much that I allowed my PS+ to expire so I can buy these games out right lol. Waste of money but I have no regrets. So I am going to be a little said of the discontinuation of IGC on PS3 because it was that allowed me to open my mind to new gaming experience. I took gaming risk because of that. So, thank you, Sony! Just to be sure, is that March 2019?? That’s what they said. What else would it be? It being on a Friday is odd, especially considering we’ll have passed Tuesday March 5th, 2019. But aside from that, it’s not odd. The better question is whether there will be PS Plus titles offered in March, 2019 for those 3 days from the 5th to the 7th. Starting next year on March 8, 2019. Next Year.